Born in Silao, Guanajuato, this great painter was a master of various techniques although he is most known by his contributions to the Muralist movement in Mexico. Chavez Morado became interested in the arts through his grandfather who had a large library with books on history, literature and poetry. When Chavez Morado was 18 years old, he left Mexico for the United States and Canada to work in the salmon fishing industry and later met muralist Jose Clemente Orozco at the Pomona College California. The meeting was a turning point for his career. And in 1944, his first exhibit was shown at the Galeria de Arte Mexicano (known as the famed Galeria Pita Amor until 1935). Chavez Morado's mural of Venetian mosaic can be seen on the wall of the science faculty at the main campus of the National Autonomous University of Mexico in Mexico City. Other famous examples of his work include the impressive Quetzalcoatl mural at Centro Medico Siglo XXI, as well as the tower which sustains the so-called "umbrella" (resembling a "pre-Hispanic" depiction of the earth and the underworld) at the National Anthropology Museum's main patio. 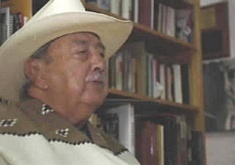 Jose Chavez Morado was awarded the National Arts Prize in 1974 and received an honorary degree from the National Autonomous University of Mexico in 1985. In addition, Chavez Morado founded the Integracion Plastica Workshop at La Ciudadela in Mexico City to share and teach other artists.